APHA Colt by Special Invitation (Superior Western pleasure and World Champion producing stallion by Invitation Only) and out of CC Looks Like a Goodbar (by Zippos Mister Goodbar). APHA Breeders Trust nominated. 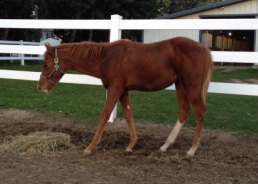 AQHA/APHA colt by Only Krymsun (Tom Powers champion stallion by One Hot Krymsun) and out of a mare by Sky's Blue Boy (AQHA World Champion producer). AQHA Incentive Fund and APHA Breeders Trust Nominated. APHA sorrel overo colt by Special Invitation and out of Sensational Touch (full sister to Sensational Lollipop by Zippos Sensation). APHA Breeders Trust Nominated. APHA sorrel overo colt by Too Sleepy to Zip (AQHA Congress Champion and AQHA Congress and World Show Champion producer) and out of Investors Prototype (ROM earning mare by Major Investor, out of a Sonny Dee Bar mare). 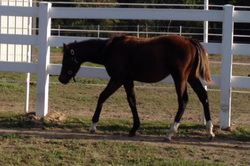 He is a full brother to APHA superior western pleasure and all-around mare, No Time For Sleepin. APHA Breeders Trust Nominated. 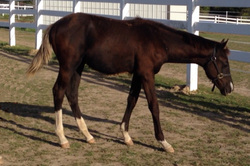 AQHA/APHA black colt by AQHA Congress Champion and AQHA World Champion sire, These Irons are Hot and out of TC Terrific Sunset (APHA/AQHA all-around point-earning mare). AQHA Incentive Fund and APHA Breeders Trust nominated. AQHA bay colt by RL Best of Sudden (Superior and World Champion producing stallion, currently ranked 2nd on AQHA's leading sires list) and out of Roansome Sierra Mist. AQHA Incentive Fund nominated.